Pizza Hut cannot receive enough credit for their marketing campaigns in 1990 and 1991, which appealed to both kids and 80-year-old grandmothers. Knowing the NCAA Tournament would cause fans to not leave their couches for up to 12 straight hours, there were not two more wise investments than delivery pizza and catheters. How did Pizza Hut determine the best way to differentiate themselves from other pizza chains? By selling an official miniature NCAA Final Four basketball that suddenly turned a family into the Harlem Globetrotters. 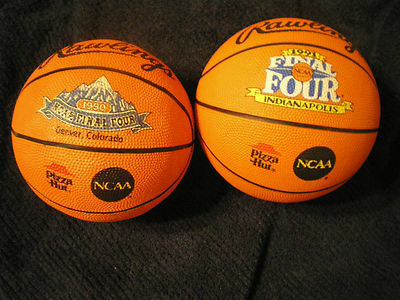 The 1990 Final Four was held in Denver, Colo., the 1991 Final Four in Indianapolis, and their official logos adorned the Rawlings basketballs that caused youngerts (myself included) to beg their parents to go to Pizza Hut. The basketballs were sold for $2.99 with purchase of any pizza. I missed seeing the 1990 commercial advertising the basketballs, which I blame for my lack of knowledge in the tournament itself, ergo having to look up what college won that year (UNLV). Being 11 years old at the time, I couldn't help seeing the highlights on TV, but I honestly thought tournament games were played everyday, at all hours of the day. This would have resulted in, approximately, 372 games during the month of March alone. I also did not realize the NIT was a separate tournament; in fact, every time I heard someone reference the NIT, I thought they were showing highlights of MIT's basketball team. Since MIT is a Division III school, there is no hope of the school participating in the NIT, which would have resulted in either a black hole, a vortex or an explosion . . . something that would need to be studied at the Massachusetts Institute of Technology. Fortunately, I did not overlook 1991's commercial. Seeing a toddler, a policeman, a school bus full of kids and a car full of teenagers pass the ball back and forth in the 1991 commercial (as "Sweet Georgia Brown" played in the background) was all it took to sell me. Seeing an infant in a stroller spin the ball on their finger bred a jealousy in me that still exists to this day. That baby may be 25 years old now, but their ball-spinning skills peaked during that commercial shoot. I had designs of owning the miniature ball and making behind-the-back passes throughout my house, threading the needle between the lamp and the couch. Those were far more entertaining activities than trying to copy a CGI baby. Knowing how the basketballs I played with outside soon grew dingy and weathered, I vowed not to take the ball outside. It was going to be a collectible, not a plaything. And I'm proud to say I still have the ball in pristine condition, sitting on a shelf. And it's a quarter of a century old. Pizza Hut continued their Final Four sponsorship in subsequent years, selling regulation-size basketballs in 1992, 1993 and 1994. But those did not have the same appeal. Not only were the mini basketballs cheaper, but try getting Mom and Grandma to approve using a full-size basketball for indoor ball drills while eating pizza.